Weakness in the abdominal wall can cause the internal organs to push out, forming a bulge. This condition is called a hernia. A ventral hernia is a condition wherein the abdominal wall bulges out due to weakness in the muscles of the abdomen, causing pain, difficulty in standing up, pain while coughing and straining during bowel movements. Severe cases may lead to strangulation where the blood supply gets cut off to the tissues in the hernia, and is considered an emergency condition. 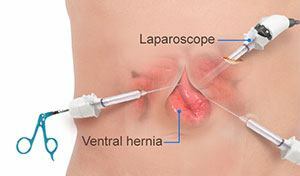 Treatment involves ventral hernia repair surgery. Open surgery: In this procedure, a large incision is made in the abdomen. The protruding tissue or organ is pushed back to its original position and sewed securely. A specially designed synthetic mesh patch is then sewed over the weakened area in the abdominal wall once the hernia is pushed back to reinforce the abdominal wall, thereby reducing the risk of hernia recurrence. Keyhole or laparoscopic surgery: In this procedure, your surgeon makes a few small incisions on your abdomen to insert the laparoscope (a slender viewing tube with an attached camera) and other surgical instruments. Carbon dioxide gas will be introduced to help your surgeon view the surgical site more clearly. Images captured by the laparoscope on a video monitor guide your surgeon through the surgery. Your surgeon separates the hernia sac from the surrounding tissues. The other surgical instruments inserted along with the laparoscope are used to push the organs back into their original position. A special mesh is secured by sutures, staples or tacks behind the abdominal muscles so as to reinforce the abdominal wall and minimize the risk of hernia recurrence. 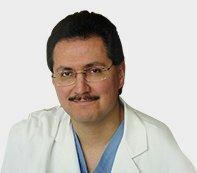 As with all surgical procedures, ventral hernia repair may be associated with certain complications such as chronic pain, infection, damage to adjacent tissues and recurrence of the hernia.